Welcome to Ranney School - an independent co-ed, Age 3-Grade 12 college preparatory day school serving students across Monmouth and Ocean Counties. Ranney School is a special place, where strong partnerships and lasting relationships form among students, parents, and teachers. 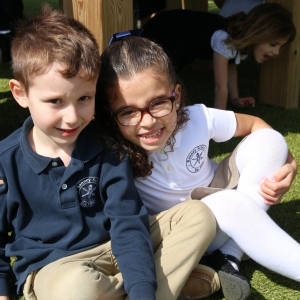 With a shared commitment to the school's mission and values, our nurturing and inclusive community supports academic success, while encouraging balance and the pursuit of interests and talents in and out of the classroom. As an Age 3'Grade 12 independent school, we focus on helping every child build academic, leadership, and interpersonal skills that prepare them for each chapter in their educational journey. During our school's rich 55-plus years of history, our beautiful 60-acre campus and facilities have evolved to meet the changing needs of our students. While we strongly value our school's traditions, we also strive to be innovative and adaptable to continue to cultivate resilient, globally-minded citizens who are prepared to succeed and reach their full potential both at Ranney School and beyond. Our mission to nurture intellectual curiosity and confidence to inspire students to lead honorably, think creatively, and contribute meaningfully to society is unwavering. A Ranney School education continues to be highly personal, seeking to encourage and challenge children to pursue their individual ambitions in academics, the arts, athletics, and other extracurricular and co-curricular opportunities. With a faculty of experienced professionals who are specialists in their fields, we provide a student-centered approach to education that is essential in fostering a rigorous and dynamic curriculum, enhanced by collaborative, project-based learning. As a result, our students learn to think critically and creatively. These are exciting times at Ranney, and our strategic plans for the future are ambitious but also achievable. We see a substantial level of interest in a Ranney education from families across Monmouth and Ocean Counties, and we are proud to enroll a remarkably talented and diverse student body each year. We invite you to learn more about our school through a campus visit. It is during these personal connections with our students, faculty, and staff that the full breadth of Ranney's strengths and offerings becomes clear. We look forward to welcoming you and your family to Ranney School. Tours are available year-round. PLUS: The RANNEY SUMMER INSTITUTE offers enrichment and prep courses in reading, writing, and math across all grade levels, as well as band and orchestra camps.